This is a 2011 card game by Eduardo Baraf and Thomas Denmark. The game itself was not a massive critical hit, and I saw it this CanCon past in a cheap bin. I’d have grabbed it but there’s always something that has to be cut from that kind of shopping list. It’s a game about building a word with letters, and each letter you use has an effect. 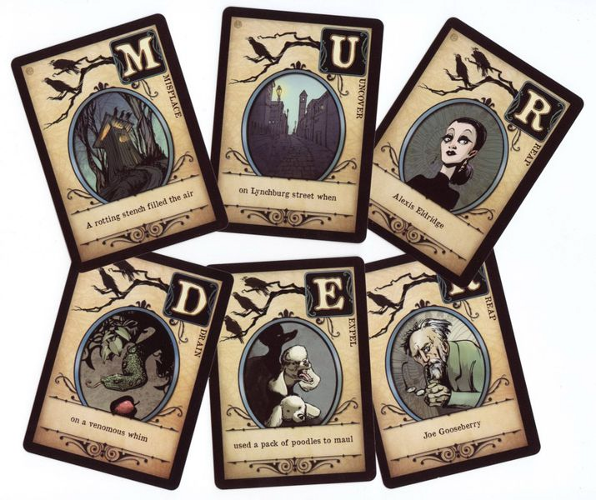 In this case, the word is MURDER, with each card doing things like messing with others’ hands, drawing you cards, or whatever. It’s basically a very simple tableau builder, and a bit of a take-that game. One of the complaints about the game is that it’s not particularly complex, and another that the game needs to use its reference cards constantly. 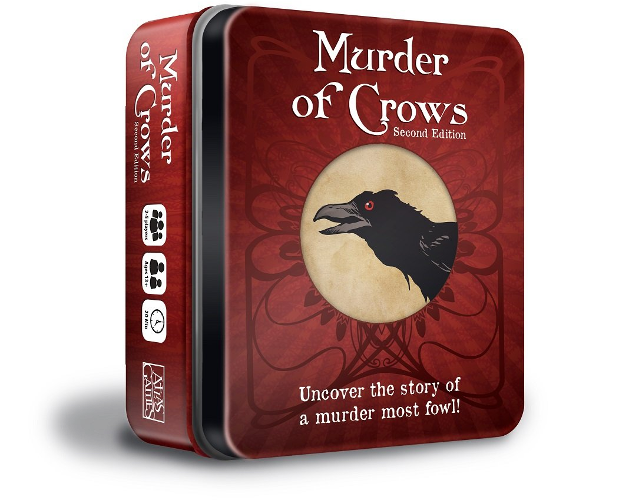 There’s play and counterplay – see the crows in the corner? You can counter a card with any other card of a higher crow value. It does look a bit like it can get into loops where players Misplace cards from each others’ words into their own hands repeatedly, which I imagine is frustrating. Another thing this game has that I like is a payoff. At the end of most builder games, players review what they did. In this case, the winner is the only one with something to review, which is a single sentence describing a murder. In this game, the thing I like the best is that because R happens in the middle and the end of the word, every potential murdere is also a potential victim, which is just some neatness. It does go for a little more comedic than the grim aesthetic, but I can understand not wanting to make the game too macabre. First things first, the biggest change I’d make in this kind of game is I’d put the rules text for each letter on the card. In some games you can expect players to memorise each piece, but needing to wait for that slows down players getting towards mastery. Second, if I make that change, I’d then make it so each card can (but doesn’t have to) have different mechanics. Not unique mechanics for each card – then it becomes a real challenge to work out what you’re doing, and every hand becomes a unique combination. I do like the idea that letters have a strength that allows them to overcome one another, or to counter one another. This again doesn’t have to be numbered up-down scale, but could be a circular paper-rock-scissors style. The use of a word as tableau opens up other options – Fox has suggested she’d want more letters and more potential words. Obviously if you do this I think you have to discard the fiction just because there’s so many options and you wind up with more of a scrabble arrangement than a tableau builder. Still, she then spent the rest of the evening making references to words you can spell with ‘MURDE.’ I think the six-letter tableau is a really good mechanic, though, that’s just enough turns that it means it’s obvious when someone has a lead and other players can direct their attention there. If I was going to do a design of my own like this, I really think I’d want a word no longer than seven and no shorter than five letters long. The final thing is payoff. In this game, you have a narrative, a theme and a fiction all constructed with your word choice and there’s that wonderful double-use of the Rs. One of the problems with this kind of game design is what I think Nora Reed has talked about with the twitter robot problems – when you weld clauses together even at semi-random, the easiest thing to get is nonsense, and when you get nonsense, one of the only ways to make that an acceptable outcome is if the outcome is meant to be funny. A more serious tone might lose the capacity for a payoff.